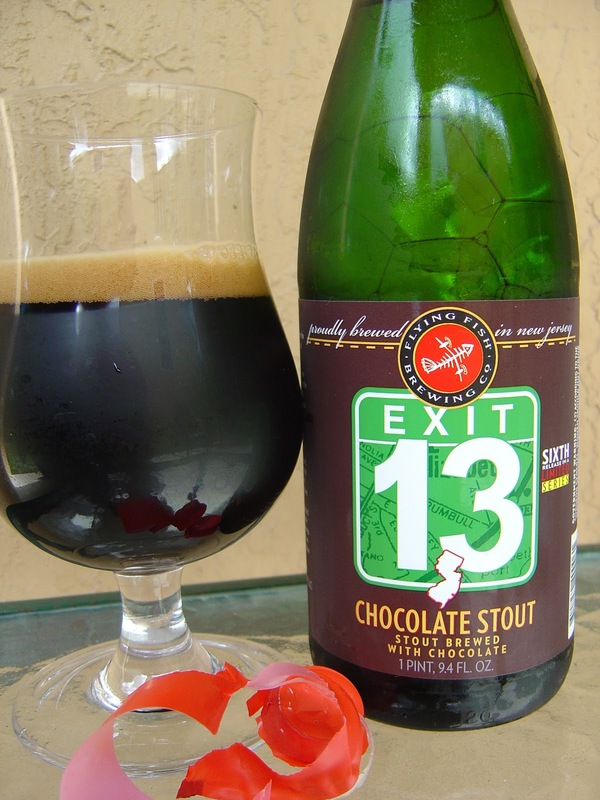 This afternoon I'm drinking Exit 13 Chocolate Stout brewed by Flying Fish Brewing Company in Cherry Hill, New Jersey. 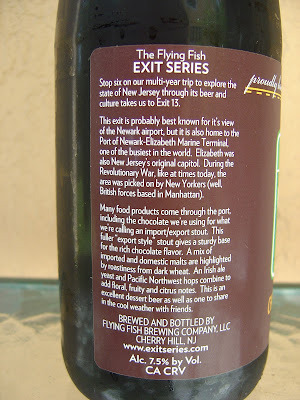 This is the Sixth Release in their Exit Series of beers meant to "explore the state of New Jersey through its beer and culture". 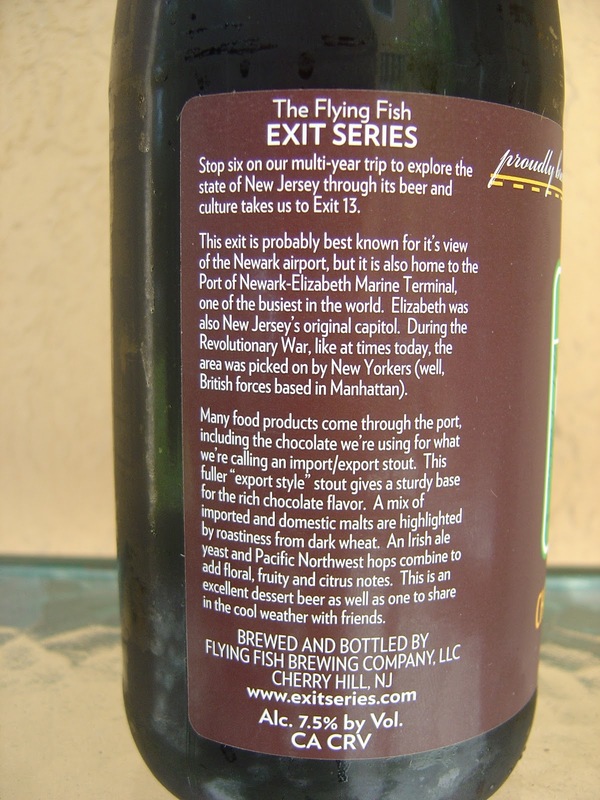 The label goes on to talk about Exit 13 and it being known for the Newark airport and the Port of Newark-Elizabeth. I've passed that area a lot of times. I'm pretty sure it's in the "smelly-keep-your-windows-rolled-up-tight-zone" of the state, too. 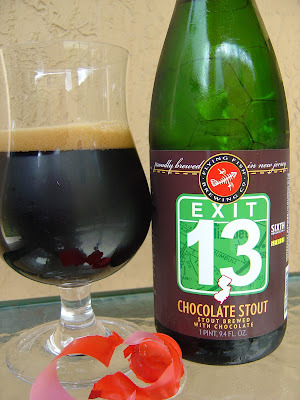 I'd have probably skipped naming a beer after that exit if I were in charge, but clearly I was not consulted. Anyway, you have a nice wine-sized bottle presentation. The cap and neck were covered with red plastic. Finally, the label says "proudly brewed in New Jersey". Sweet chocolate aroma, a little roasted malt, and very inviting. Roasted chocolate and malty start. My palate has been trained to believe this beer was about to dive right into a harsh roasted and burnt bitter next. Luckily, some creamy, milky flavors covered my entire mouth. Coffee flavors do add some additional character, but that's about it for the flavors. Carbonation is medium; so happy it's not flat. Body is low to medium at best; this beer could have used a lot more in this department, even approaching watery thin. Smooth. Not sweet, and well-balanced throughout. Good simple flavors. However, this was a boring and one-dimensional beer that missed more than a few opportunities to shine. The 7.5% alcohol was not very noticeable, which is neither plus nor minus. I liked this, but at $10 for this bottle, I will skip it every time. This beer is easily comparable to Guinness, and while I think this beer may have a slight edge (mainly from a texture and smoothness perspective), it's tough to ignore price point. I'd give the nod to Guinness most of the time. I think. LOL. Hi. How are you? Thank you for the compliment. I don't think I'd say decadent about this beer. Was OK but not great.